East Coast Fittings Limited (ECF) located in Rearsby, Leicestershire began life in 1980 and has grown to be a leading trade only distributer to the Kitchen, Bedroom and Bathroom market. ECF’s 130,000 square foot premises houses two complete manufacturing production units, warehousing, transport, administration and for the local tradesperson – a trade counter. The location also features a Design and Marketing Suite which includes displays of products, meeting rooms, and IT solutions that can take room dimensions and showcase the different designs and colours possible. This facility is made available to ECF trade customers for use with their own customers. 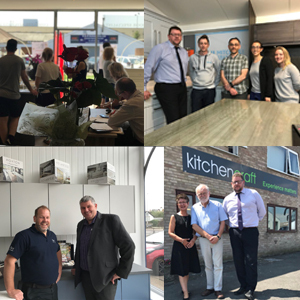 Not only do we offer exceptional levels of personal service and support, you’ll also find one of the most extensive product ranges available today including brand names like Blum, Caple, Sensio and Egger based products but also ECF own brands that have become well established in the industry including GADDESBY Kitchens and Bathrooms, NEW FOR 2019 AUSTERHOUSE and ALTO Doors, HOXTON Doors, BARNSDALE Doors, VOLANTE Sliding Doors, SUPERIOR CABINETS, Rigid SUPERIOR CABINETS, innostor Storage Systems and Expressions Handles. By the end of 2019 these will have been joined by VOLPI Kitchens, additional handles and storage systems. MyECF our online ordering platform, advanced marketing and online services, advanced audio and video communications allow our Territory Sales Managers to connect to customers instantly in a collaborative manner, to product management, planners, marketing and suppliers – all focused on bringing their expertise to help build your business. Our continuing programme of investment in the latest technology has been featured in our Intact partners video reference. The video is a good reference for showing ECF in action. ECF has a customer portfolio numbering in the thousands with fitters, national retailers, developers, contractors and OEM’s from across the UK and Ireland. We understand the level of support you need to successfully run your business, so you can count on us to make your life as easy as possible. A vital part of that support is good communication, so our UK based team of customer, technical and marketing experts are always at the end of the phone, ready to help with whatever you need to get the job done. From advice on hinges to ordering doors to technical installation support, we're with you all the way. To keep up with our new designs and innovations, simply visit our News section, download our latest brochures, call our Customer Service Team on 03330 032 000 or email help@ecf.co.